A soldier's goodbye, with Bobby the cat. Photo by Sam Hood ca. 1942. Samuel John Hood (20 August 1872 in Southern Australia - 8 June 1953) was an Australian photographer and photojournalist whose career spanned from the 1880s to the 1950s. Hood opened his first studio in 1899, with the main source of income being generated from portraiture and weddings. Hood supplemented this income by selling framed images of sailing vessels to their crews upon arrival in Sydney Harbour. Many of these negatives are now held by the Australian National Maritime Museum, Sydney. 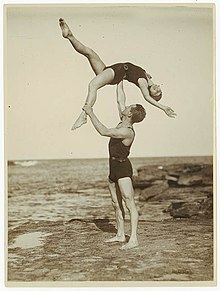 In 1918 he acquired the Dalny Studio at 124 Pitt Street, and began to expand his business into press photography, providing photographs for The Sydney Mail, The Australasian, the Daily Guardian, the Daily Telegraph Pictorial, the Labor Daily, The Sun, the Daily News, and The Sydney Morning Herald. Press photography increasingly came to dominate his business, and in 1934 he joined the Labor Daily for a short time as a full-time photographer, engaging other staff to look after his studio. At the beginning of Hood's career photography in newspapers was a novelty, and although the technology to reproduce half tone illustrations was in use by 1880 the Australian papers and in particular wood engravers whose job it was to illustrate articles resisted the new process. The Sydney Morning Herald did not reproduce a photograph until 1908. Sam Hood is acknowledged as a trailblazer in this genre - becoming adept at capturing the sensational, trivial and in particular sporting moments with his camera. A number of photographers worked for Dalny Studio: some of these include Ernie Bowen, Gus Daley, Jack Lazern, Lethington Maitland as well as Sam's own children Gladys and Ted. By the mid-1930s most newspapers employed their own photographers, and Hood's commissions from the papers began to decline. Hood sought other kinds of commissions, and won a number of long term advertising and commercial contracts. He contributed a number of photographs of Sydney buildings and streets to Building, Construction and Australasian Engineer during the late 1930s and early 1940s. Hood also had extensive contacts in the entertainment industry, who called upon him to document celebrity events and stars, as well as theatre advertising. Throughout his career he worked at the stock-in-trade for commercial photographers: portraits, weddings and even funerals. The State Library of NSW acquired a collection of negatives from Sam's daughter Gladys Hood in 1973 comprising some 30,000 images. Sam Hood's story is well documented in a volume produced by that institution and there are several images from that collection of Sam Hood with cameras and accessories included in this acquisition. ^ Davies, Alan (1991). 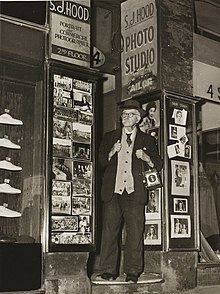 Sydney exposures : through the eyes of Sam Hood and his studio, 1925-1950. Sydney: State Library of New South Wales. ISBN 0730588963. Wikimedia Commons has media related to Sam Hood.